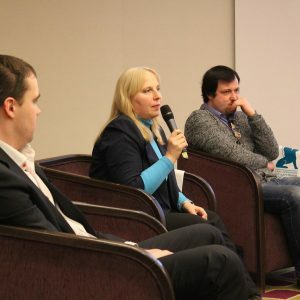 On February 27, 2018 in St. Petersburg took place the “Project-oriented learning – a look into the future. Competences Workshop” meeting. The main purpose of the event was to discuss the prospects for the implementation of project-oriented education in Russia. The meeting was concentrated on the development of professional and personal competencies of young specialists through project-oriented leadning, active interaction of employers and students and modern requirements for the young specialists training. Basing on the international concept of CDIO (Conceive – Design – Implement – Operate) Valentin Olenev, specialist in the implementation of this educational standard in SUAI, associate professor of the department #14 of aerospace computer and software systems”, head of EmCoMobile laboratory, noted that the format of project-oriented learning in engineering significantly increased the student’s progress and their interest in learning. 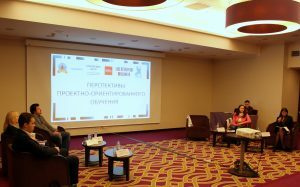 The practices of implementing CDIO educational program on the example of the Faculty of Service, Tourism and Hospitality of the St. Petersburg State Economic University was considered within the framework of the meeting. Meeting was attended by government representatives, youth organizations, representatives of tourism and MICE industry, as well as students and pupils of St.-Petersburg educational institutions. Click here for details. Click here for details.